A top priority at MCFTech (www.mcftech.com) is to encourage exploration of leading ideas, not only in business technology but also in organizational culture, with an aim of creating a true company of the future. One of the top reasons we find that people get excited about the potential to work with us is the opportunity to continually be challenged and grow. 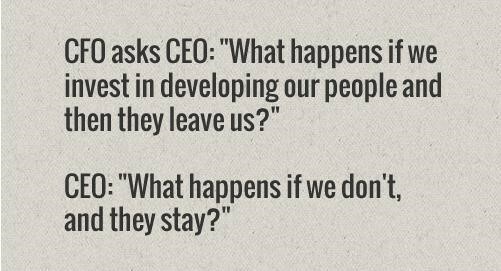 The above graphic more than explains why it is paramount for any company to invest in the skill development of its resources. In a work environment where the employees don’t see any skill development happening, the first bullet above becomes true. To take an example in the IT industry, let’s consider a .Net developer who is fresh out of his college education into his first job. She’s a raw resource. At this point she only has knowledge of the technical constructs of the programming language. As she grows in the organization she learns of the industry best practices. She learns different ways of approaching a problem. She might get to attend internal trainings, external trainings and certifications which further add to her credentials and skillsets. She has now developed into a fruitful and productive resource. This is exhibited in her daily work where she is able to do more and do better. She is growing in a “Learning” work culture. Consider the same resource in an environment where she is not getting these opportunities. There are no training avenues. Technical certifications are not really encouraged, and rather seen as a not so productive investment of time. How does the resource grow when there is no learning? The day job is all that she has, and it becomes a routine. Monotonous. At some point, she feels frustrated, and decides to find a better option. In such cases, the good intentions of the company are lost as the employees are not able to leverage the skill development resources. As much as the company provides the facilities to enable “Learning”, the employees should also be adequately incentivized to adopt these programs. Learning aids growth and this should really be one of the focus areas for the company, as well as the individual. The employees must also take the time out to hone their skills. The below are a few things I feel every company must do to promote a growth-oriented work culture. Resident experts can share industry best practices and industry case studies from other companies. At the same time, internal results should be converted into case studies and publicized on external forums to gain appropriate visibility. Individuals/Project teams showing such best practices in their capabilities should be appreciated so that they are positively reinforced to adopt this behavior. There can be many such things that can be done by the company and employees to ensure that the work environment is conducive to growth and learning. Depending on the size and maturity level of the company, one or more of these measures will be applicable, and should be adopted. This is the first step in ensuring that Learning happens. As the employees start focusing on their individual development, the organization as a whole will develop. Once the ball is set in motion, the next step is for the employees and the organization to do periodic reviews to make sure things are progressing. There are several tools available to aid this review process, and we’ll see some of them in next article.